At Hol Drainage, we believe that a well-designed agriculture drainage system is the most influential farm operation investment you can make. With the right management, you’ll see a return on investment year after year. However, it is a significant expense, and before you make the decision to invest in drainage tiling, you’ll want to know that it is worth the cost. 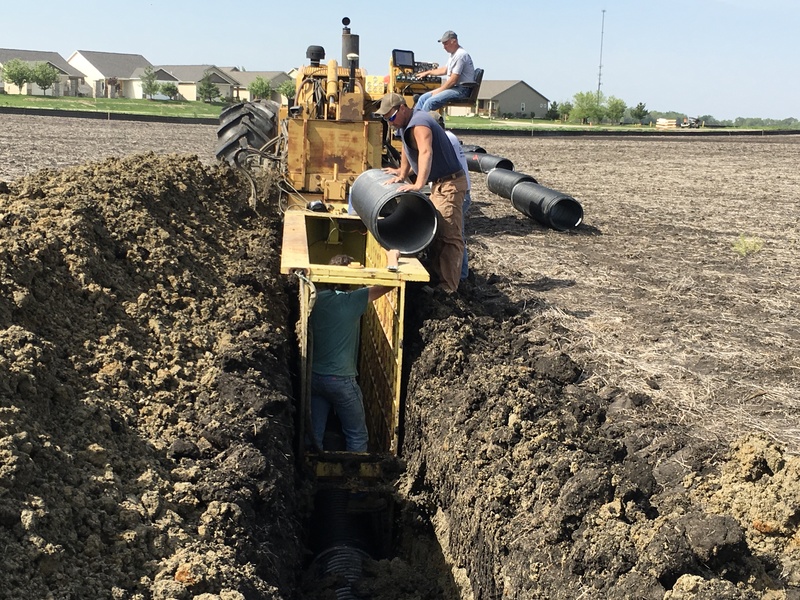 According to the University of Minnesota Ag Extension, drainage tiling increases crop yields on poorly drained soils by providing a better environment for plants to grow, especially in wet years. The systems help improve field conditions for timely tillage, planting, and harvesting. According to the Iowa State University Extension, more than six million acres of cropland in Iowa deal with wetness that limits productivity, and just over half of the 375 different soils series mapped in Iowa have problems with too much water. Extended periods of wetness prevent timely fieldwork and cause stress to growing crops. Subsurface tile drainage is a proven solution to this challenge. Drainage and tiling can have numerous beneficial results. One of the most significant is increased land value and yields, and more consistent yields. This is increasingly true in recent years due to higher grain prices. Your land will move close to its maximum production level with a well-designed drainage system. For the landowner, this means increased land value; when the time comes, your acres will sell for a higher per-acre price if they boast a properly installed drainage system. More consistent yields allow for more efficient use of resources and less financial risk. An extended growing season and total-field farming is something growers with well-drained fields look forward to. If your field has “stubborn” wet spots that you wait for at planting or harvest, properly spaced sub-surface drainage tiles will help balance your field to enable total-field farming. In the spring, soil will warm up and dry out faster, and it’s likely that you’ll be able to hit the field for spring operations earlier in well-drained soil. In fields with proper drainage, deeper root growth and better plant health is possible. Water tables that are too high limit root growth. Root growth requires that air be present in the soil, and that can’t happen when the spaces that could be filled with air are instead saturated with water. The deep, even water distribution created in a well-drained field provides room for air pockets and encourages deep root systems, which are key for optimal plant health. The healthier your plants, the better able they will be to stand up to adverse conditions like drought or pests. Good drainage also results in improved soil structure. If wet areas linger in fields, traffic is forced to drive around them, creating irregular traffic patterns. This can lead to widespread compaction, which results in poor root development. In well-drained soil, compaction is limited because traffic patterns can be controlled. Also, you’ll see increased bacterial action, better soil aeration, and reduced erosion. Reduced and more predictable production costs are seen in soils with adequate drainage. With well-drained soil, you’ll make better use of your inputs. Wear on equipment and fuel usage will decrease in soil with a sound structure. Also, soil performance in adverse conditions, such as extremely dry or wet weather, is more predictable, making management easier. Don’t over-apply nutrients―adding more fertilizer than is recommended only leads to more potential for nutrient loss. Employ controlled drainage, which is widely recognized as effective in mitigating nitrate losses. With this practice, water control structures are strategically place throughout the drainage system, which causes the water table to rise while decreasing the drained depth of the field. This decreases the volume of water drained, leading to decreased nutrient loss. The Minnesota Ag Extension notes that with proper management, controlled drainage also has the potential to improve crop yields by making more water available to plants. How is proper drainage designed? All aspects of a subsurface tile drainage system must be designed to work together for maximum benefit and efficiency. Experienced drainage system designers and installers use the latest technology like RTK GPS mapping to achieve a system that provides the benefits listed above. At Hol Drainage, we will put the latest technology available for drainage system design to work for you. According to the Iowa State University Extension, in a successful system, the water table between tile lines should be lowered within 24 hours after a rain to six inches or more below the surface. At this level, most crops will not experience injury. During the second day after a rain, the water table should be lowered again, now to approximately one foot. By the third day, your subsurface drainage system should lower water levels to 1.5 feet below the ground surface. Call us for a consultation―we’ll take into account every unique aspect of your farming operation.